This one-of-a-kind, low-bank waterfront lot is an increasingly rare offering in Metro Vancouver. Sunny, private, with almost an acre of land on 490 feet of waterfront with a panoramic ocean view. A sunny, south-facing lot with views of Lion’s Gate bridge to east and golf course to south & west. This lot offers plenty of room for your home, garage & gardens. Sunny corner lot with views of Howe Sound. A unique rock bluff provides unique opportunities for landscape design. The sunny flat yard to east is easy to fence making it perfect for a family with small children and a delight for gardeners. An outstanding panoramic view lot with sunny southern exposure and an unobstructed, ever-changing view of English Bay, UBC, the Gulf Islands & Vancouver Island. 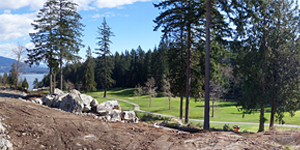 With views to delight any golfer and sunny south exposures, these three lots are located on a quiet cul-de-sac at the edge of a trail which is walking distance to the clubhouse and the municipal park at Seymour Bay. Private hillside lot with sweeping views of English Bay, Vancouver, Jericho Beach, the UBC lands, the Fraser River Flats (and in the distance, Mount Baker and the Gulf Islands). Rock bluffs to the rear create a very private backdrop for this hillside lot which opens up to spectacular views of English Bay, Vancouver, Jericho Beach, the UBC lands, the Fraser River Flats (and in the distance, Mount Baker and the Gulf Islands).